It's ok with IE but doesn't work with Firefox. Mikemarch, I checked it with FireFox 1.0.1 and seems to be working for me - Perhaps I used a different version than yours. Carfield Yim, I read through the licence agreement and the terms and conditions before writing the app and I don't think my little demo violates any of the terms. The only thing I think you may be refering to is: "And you may not use the search results provided by the Google Web APIs service with an existing product or service that competes with products or services offered by Google." However, the demo is not competing with google, it is only using the API to demo a trivial app. Also, they actually suggest that the apps to be developed are "totally up to you and your creative genius." I'll read it again, just in case - Thanks for the heads up. "And why aren't you using an iterator." Creating a brand new object (Iterator) to traverse to the list seems to be a waste of memory and CPU. Of course with this little demo it makes no difference, but, with thousands of concurrent users you may see the difference. 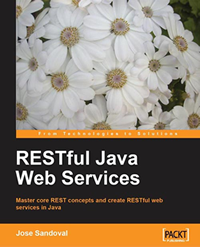 Have you read Enterprise Java Performance? These guys have some reviews on Java Enterprise Performance books. But, I agree with you, an Iterator would be more OO like and would be a more Javaesque solution. To each its own, I guess. Using iterator is faster at many cases. 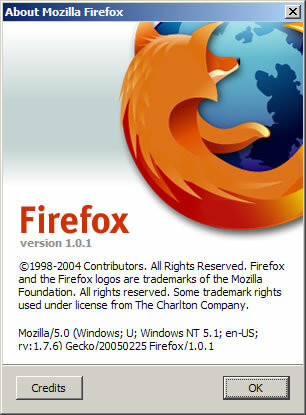 I've tried the demo with Firefox 1.0 and 1.0.3 with no luck. I am behind a proxy, so I think that may have something to do with it. However, it works in IE behind a proxy, so perhaps it is a bug with Firefox, not inheriting the proxy information when making the "remote" call. 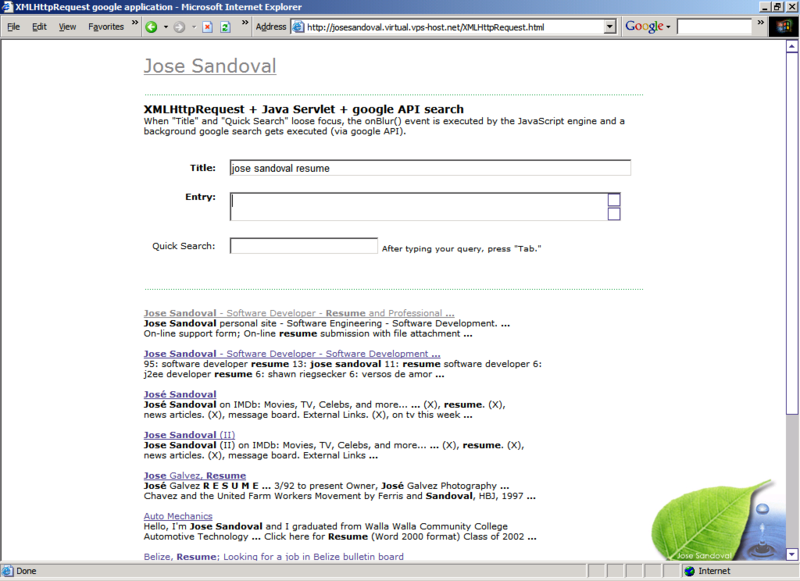 me gusto mucho tu ejemplo, de hecho el primero que encuentro para java y lo unico que te queria preguntar es que si sabes como puede hacer para que en lugar de puro texto que me retorne el search, pueda visualizar una imagen... ya sea desde una base de datos o desde un archivo en el servidor local. Not in Firefox for me either (IE ok). Wonder why the inconsistency; maybe Firefox settings? I've looked at mine, but cant' see anything obvious. Initially, it did not work with Firefox, but I re-ran the Firefox install and selected the 'developer tools' option in custom install; this installs the Dom Inspector, and now it works. This is nice, how would you add the feature "more results" to this? If you are running it on my server, you probably found that google wasn't connecting. I just tried it and it seems to be working. 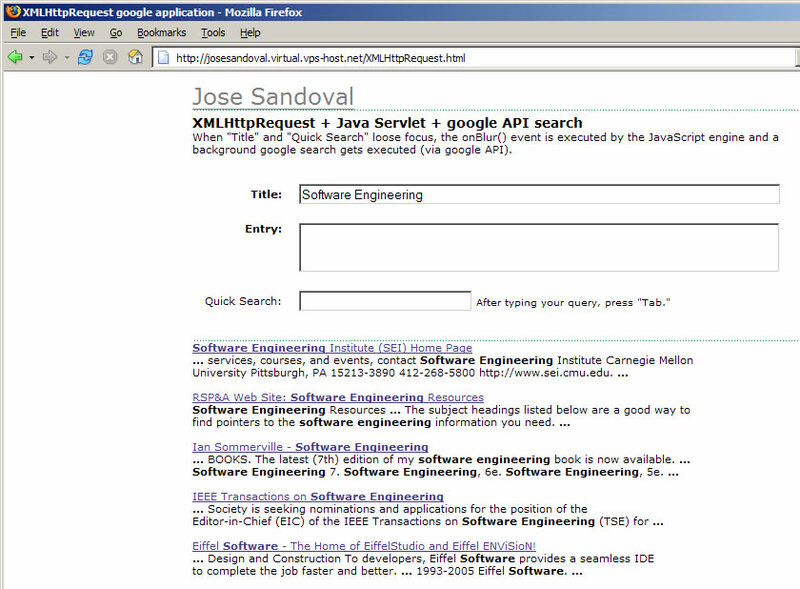 If you are running on your server, you need your own google API key.